Download "J.D. 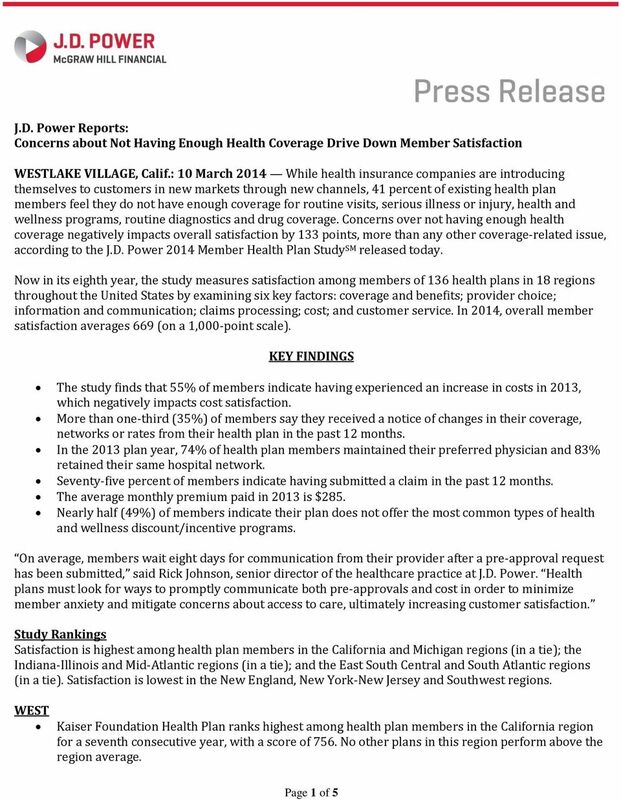 Power Reports: Concerns about Not Having Enough Health Coverage Drive Down Member Satisfaction"
5 J.D. 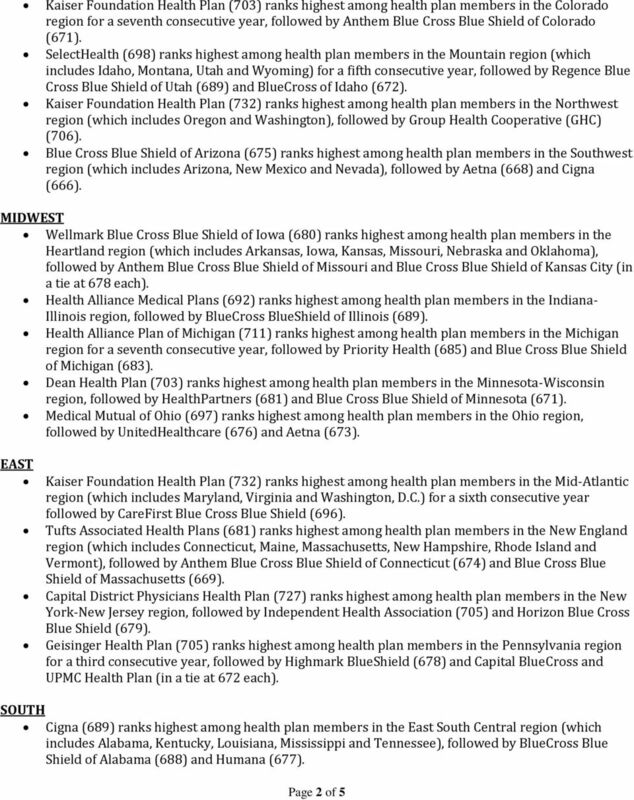 Power 2014 Member Health Plan Study SM Top Three Plans in Overall Member Satisfaction by Region California* Colorado* Anthem Blue Cross Blue Shield of Colorado East South Central Highest: BlueCross BlueShield of Alabama Humana Florida Highest: AvMed Health Plans and Humana (tie) Florida Blue Heartland Highest: Wellmark Blue Cross Blue Shield of Iowa Anthem Blue Cross Blue Shield of Missouri (tie) Blue Cross Blue Shield of Kansas City (tie) Indiana-Illinois* Highest: Health Alliance Medical Plans BlueCross BlueShield of Illinois Michigan Highest: Health Alliance Plan of Michigan Priority Health Blue Cross Blue Shield of Michigan Mid-Atlantic* CareFirst Blue Cross Blue Shield Minnesota-Wisconsin Highest: Dean Health Plan HealthPartners Blue Cross Blue Shield of Minnesota * No other plans in this region perform above the region average. Source: J.D. 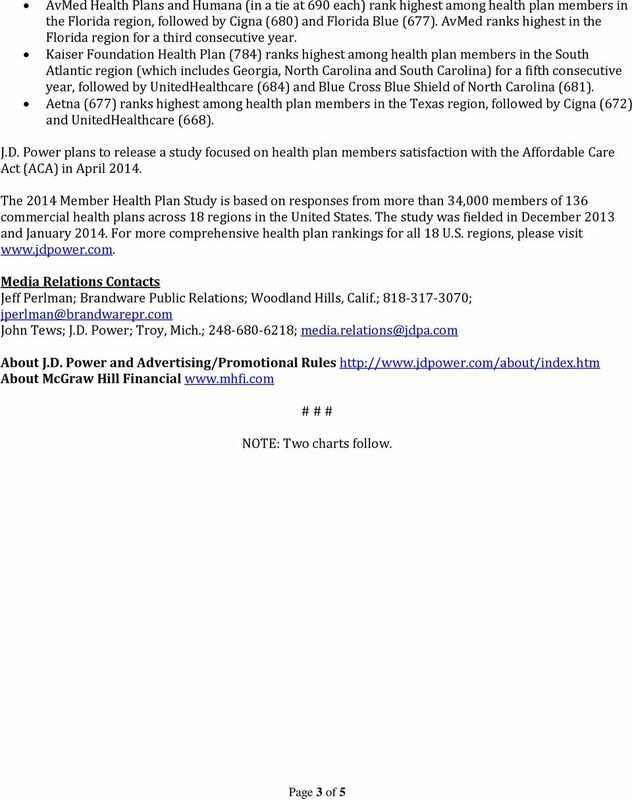 Power 2014 Member Health Plan Study SM Page 5 of 5 Mountain Highest: SelectHealth Regence Blue Cross Blue Shield of Utah BlueCross of Idaho New England Highest: Tufts Associated Health Plans Anthem Blue Cross Blue Shield of Connecticut Blue Cross Blue Shield of Massachusetts New York-New Jersey Highest: CDPHP Independent Health Association Horizon Blue Cross Blue Shield Northwest* Group Health Cooperative Ohio Highest: Medical Mutual of Ohio Aetna Pennsylvania Highest: Geisinger Health Plan Highmark BlueShield Capital BlueCross (tie) UPMC Health Plan (tie) South Atlantic Blue Cross Blue Shield of North Carolina Southwest Highest: Blue Cross Blue Shield of Arizona Aetna Texas Highest: Aetna Charts and graphs extracted from this press release must be accompanied by a statement identifying J.D. Power as the publisher and the study from which it originated as the source. Rankings are based on numerical scores, and not necessarily on statistical significance. 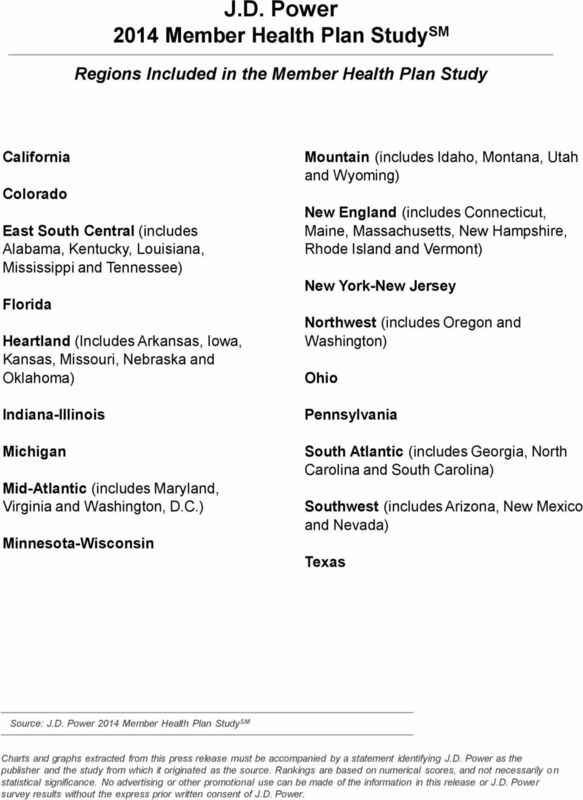 No advertising or other promotional use can be made of the information in this release or J.D. Power survey results without the express prior written consent of J.D. Power. 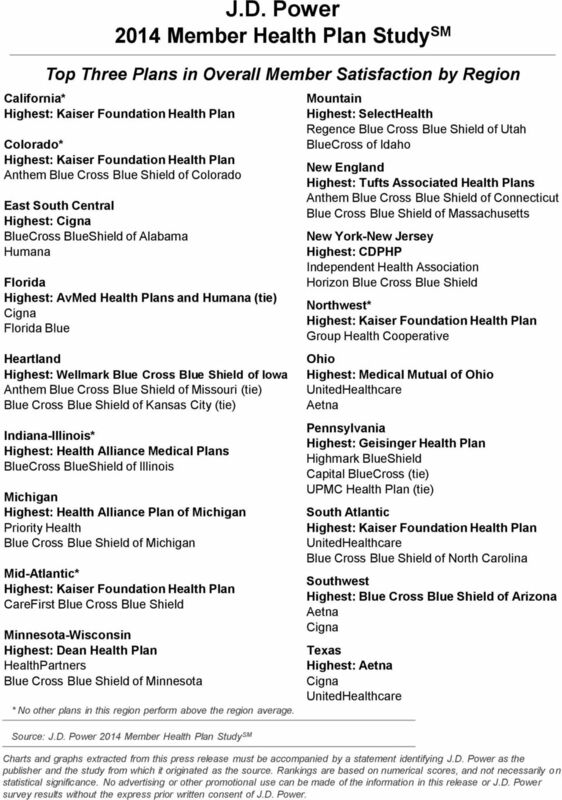 BASIC FACTS & FIGURES: NONPROFIT HEALTH PLANS 1 Of the 154 health plans in the United States with at least 100,000 enrollees, 97 (or 63%) are nonprofit, 41 are for-profit (27%), and 16 (10%) are government.